Parody is always a challenge and the more successful it is, the greater the adverse effect it can have on the original. Stan Freburg totally ruined Belafonte’s “Day-O” and “Dragnet” for us; Allen Sherman obliterated Ponchielli’s music and The “Zombeatles” destroyed any serious opinion of the ‘Fab Four’. Now, director Patrick Young has screwed up his courage, and that of his cast to present an utterly amateur take on MacB. There are certain & obvious production procedures that are intrinsic… know your lines and cues; remember your blocking points; stage managers – stay on top of your job; cast-members – be there on time! And obviously, ‘break a leg’ is an expression; not a command. As well, the phrase ‘chewing up the scenery’ shouldn’t be taken seriously! From the hilarious pre-curtain opening (Society’s president offering welcome and introductions) wherein she overlooks every editor’s mandate “Get the names right”, to the final curtain; this is a continual pant-wetting comedy. Even the background music contributes to the hilarity, i.e. Theme from Rocky; Ride of Valkyries; “Old Black Magic” and a mirthfully choreographic ‘Bonnie Lassie’. Music director Tony Bastianon actually manages to outdo himself. Macbeth is played with panache and an almost serious bent by Cassondra Padfield. No slips she emulates someone trying their damnedest, she still gets her laughs and even some audience empathy. Her sense of timing and reactive facial expressions shows great promise. As her bloodthirsty wife, Michael Esposito II is a visual and dramatic hoot. Stepping into the role by necessity, his hairy chest, mustache and masculine stance totally defeat every feminine line the ‘lady’ has to quote. Thus his (her) lines are sound & fury, signifying nothing! Definitely there is no milk of human kindness to either the actual character or the last-minute portrayal. The Farndale Ave.’s producer/director is played by Ben Hayward and one of the show-stopping assignments is to present Act IV & parts of Act V almost with one breath in order to meet the adjudicator’s time limit. Think of Bialystock’s cell reiteration from the ‘Producers’ and you’ll appreciate the Herculean task. He aces it….marvellous! The “Double double, toil & trouble” trio are as well-coordinated as the Stooges or Keystone Kops were in their pratfall shticks. How they can perform their sequences with straight faces amazes. The stage crew also have demands on their job requirements… do the job wrong. 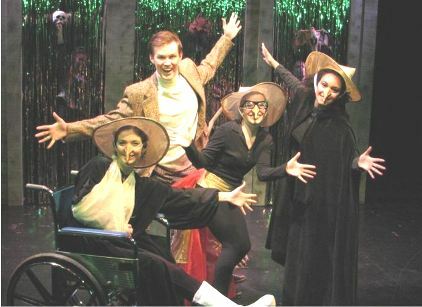 It must go against the grain to have props continually malfunction; lighting go askew; costumes get mixed-up, and cues repeatedly are unanswered. Actors are actually pushed or pulled on & off stage. The adjudicator – George Peach (how’s that for an Atlanta name?) is played –to the hilt by Andrew Di Rosa. His analysis at curtain bestows a ‘slings & arrows’ payback to all of us who profess to be critics. Seems we just think we understand what a director is trying to accomplish and our interpretations are usually rift with misunderstanding. What a blow to our self-esteem! The original Shakespearean play may be one of the Bard’s shortest tragedies but it is still the epitome of ambition and amorality. The philosophy that ‘fair is foul & vice versa’ we still witness in today’s politicos and business executives. Terms like ‘redaction’; ‘collateral damage’ and ‘acceptable casualties’ are part of the lexicon. Seeing the play in a lighter vein surely will not permanently damage the message or challenge of staging; reading; or witnessing the original. With that in mind, there are still a couple of performances left and it’s at the MiST theatre in the CCT building on UTM’s Mississauga Campus. * Way back in the fifties, our intrepid Danny ‘G’ had a High School role of Trebonius in Julius Caesar. In Act II’s 1st scene there is the line ‘The clock Strikes three”. Seems the crew missed their cue- the line was repeated and then two bongs. Danny turned to the audience and exclaimed aloud “Daylight Savings Time”. He was kicked off the stage and never acted again!